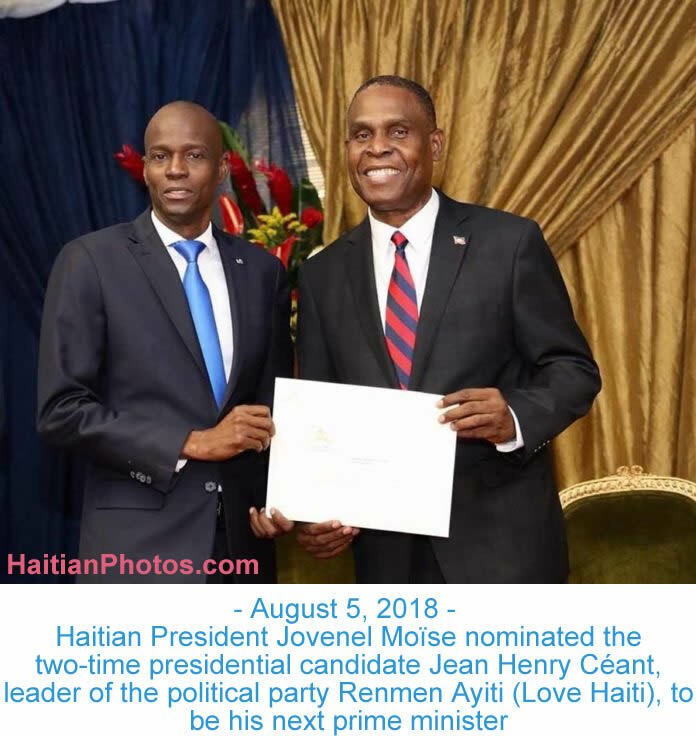 Haitian President Jovenel Moïse nominated the two-time presidential candidate Jean Henry Céant, leader of the political party Renmen Ayiti (Love Haiti), to be his next prime minister. 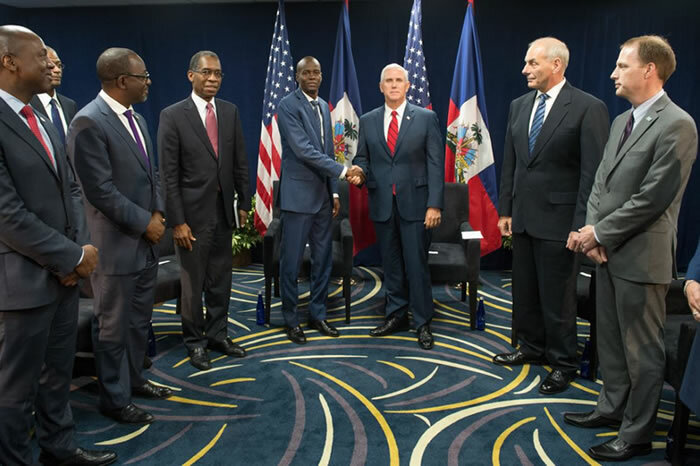 On Sunday, August 5, 2018, Haitian President Jovenel Moïse following a two-day consultation with the presidents of the two branches of parliament, and many sectors of the society in 3 earlier weeks, nominated Jean Henry Céant (61) to be his next prime minister. Jean Henry Céant, a leader of the Renmen Ayiti (Love Haiti) party was two-time presidential candidate in 2010 and 2016 .The announcement came three weeks after the former Prime Minister Jack Guy Lafontant resigned amid violent and deadly protests sparked by a proposed plan to significantly raise fuel prices. Jean-Henry Céant was born on September 27, 1956 in Goureau, a district in the Croix-des-Missions, at the commune of Tabarre (Haiti). Céant has a genial personality. A one-time notary by profession and former presidential candidate, but is known to many Haitians as a "land thief" (volè tè) for his conduct as a notary. It is a common practice in Haiti that the notaries, a cross between accountant and lawyer, instead of safeguarding the titles to their clients' land, manipulate them for own benefit. Céant is also remembered for his alleged involvement as notaire helping former president Jean-Bertrand Aristide to purchase land in the Port-au-Prince suburb Tabarre for his residence and the Aristide Foundation for Democracy and its university (UNIFA). Jean Henry Céant has a controversial background. Former Ambassador Kenneth Merten (who now heads the U.S. State Department's Haiti Desk) described Céant in Wikileaks as "Aristide's notary and a personal friend. An early supporter of Aristide, and is thought to have helped Aristide in meeting property ownership requirements so he could run for President. Céant's wealth went up significantly after his ties with Aristide." Henriot Dorcent, a Haitian political analyst described him as an "opportunist." "Under the dictatorship of Gen. Prosper Avril, he worked closely with lawyer Réné Julien, who was Céant's mentor and Avril's cousin But when the political winds shifted, he joined Aristide and the Lavalas, acting as Aristide's notaire and managed jobs for his wife as Aristide's private secretary and his brother in CONATEL. Then he jumped into the Martelly camp. When Jovenel came to power, he jumped to Jovenel's defence to save him from money-laundering scam through his business Agritrans. 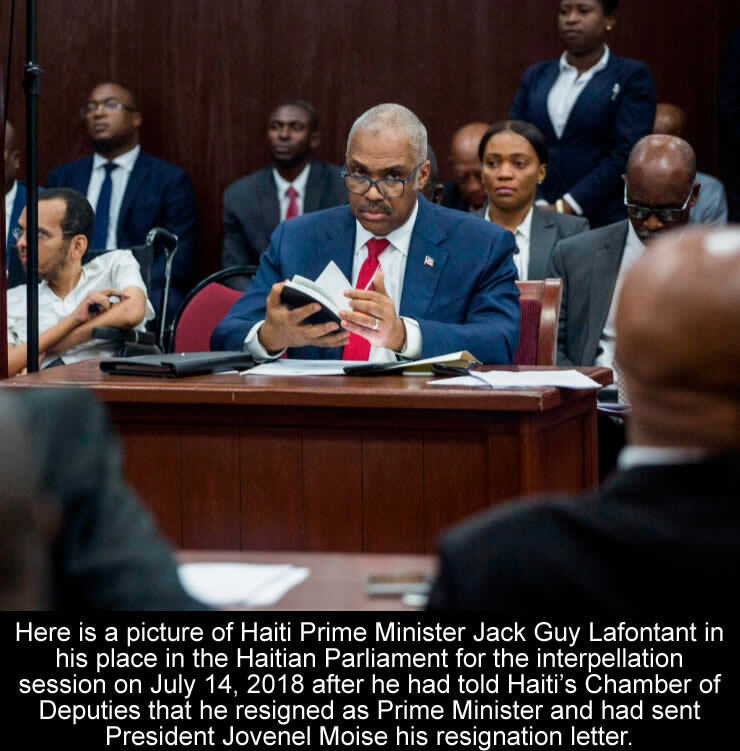 On Saturday, July 14, Haiti Prime Minister Jack Guy Lafontant declared in the lower house of Haiti's legislature: "I submitted my resignation to the president of the republic", who has "accepted my resignation". With this statement, the Prime Minister had managed to avoid a likely vote of no confidence to stepped down. Mr. Lafontant took office less than one year and half ago, in February 2017. On Saturday, the Haitian parliament had been debating whether or not to give Lafontant a vote of confidence for more than three hours. With the resignation of the prime minister, Haiti now has no functioning government. President Jovenel Moise will need to dominate a new Prime Minister. Haitian Prime Minister Jack Guy Lafontant resigned Saturday, on July 7, 2018, amid calls for him to step down over his handling of a failed plan to raise fuel prices. The announcement of the government's plan to raise fuel price set off a wave of deadly protests and took at least 7 lives. Lafontant resigned on second day of violent protests sparked by the now-abandoned plan to raise fuel prices. He submitted his resignation before the call of a no-confidence vote, which had the possibility to lead his removal. The prime minister is the second highest official in Haiti, after the president. 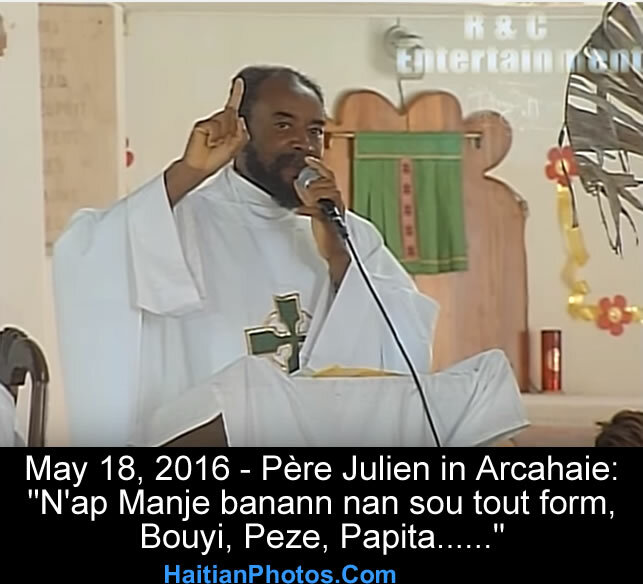 While speaking in the lower house of Haiti's legislature on Saturday, he said, "Before coming here, I presented my resignation to the president of the republic. "President Moise confirmed via Twitter that he had accepted Lafontant's resignation along with those of other Cabinet members. Mr. Lafontant, a 57-year-old doctor, was relatively unknown until he was handpicked by President Jovenel Moïse 16 months ago. In this light, chamber president Gary Bodaeu wrote on his Twitter account that the legislature "is at a crossroads in history; it must assume its responsibilities." Plan to hike the fuel price is a part of the plan to reduce subsidy under an agreement with the government with the IMF for granting a low interest loan amounting to $96 million under "Staff-Monitored Program (SMP). The opposition MPs in Congress warned that if the price increases were reinstated there would be more violence and protests on the streets. On Thursday, July 12, 2018, the IMF has suggested for a more gradual approach, a step-by-step withdrawal of subsidy which will ultimately generate the exchequer a fund totaling around $300 million (£226m). The IMF said scrapping the fuel subsidies would allow more money to be spent on key areas including health and education. 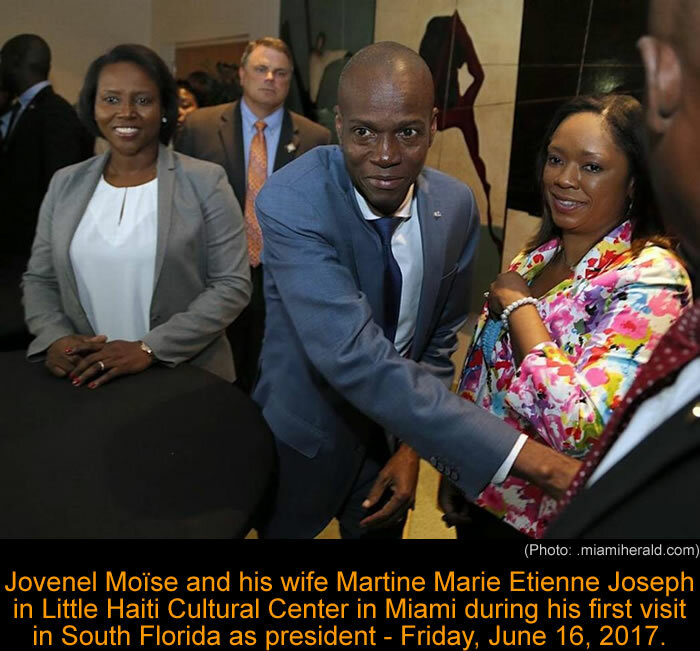 Here is a picture of Haitian President Jovenel Moïse and his wife Martine Marie Etienne Joseph in Little Haiti Cultural Center in Miami during his first visit as president - Friday, June 16, 2017. According to President Jovenel Moise: "We know an extension will terminate the 22nd of January 2018. But we are already prepared to seek another 12 months," he said. "I'm telling everyone who has TPS, calm down; know that you have a president who is working for you today." Here is a picture of Jovenel Moise's Supporters dressed in banana to support him. 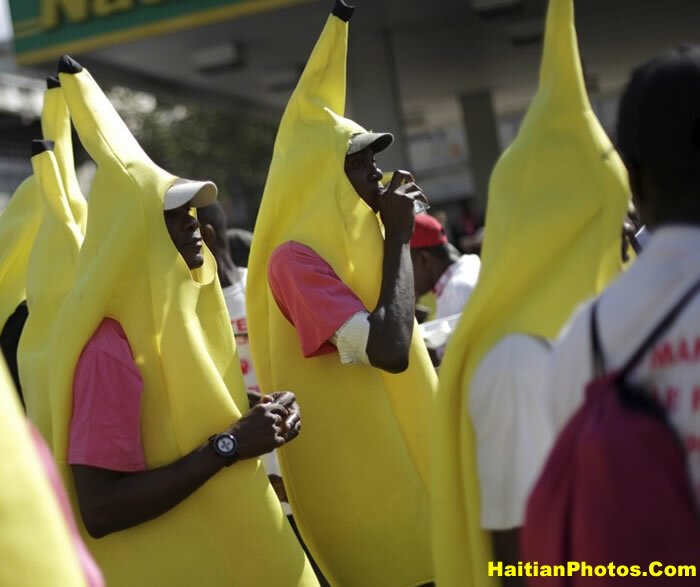 On February 2, 2016, the supporters of Jovenel Moise from PHTK party during a demonstration against plans for a postponed presidential runoff, were dressed in banana costumes. Moise, the first round winning candidate from PHTK party is Martelly's chosen successor. Moïse, in his early life, created his first business with little investment JOMAR Auto Parts in Port-de-Paix, which is still in operation today. Thereafter, he began project to supply clean water in rural areas. Later, in partnership with Culligan he opened a water plant. In 2004, he became a member (later president) of the Chamber of Commerce and Industry of the Northwest (CCINO), later promoted to Secretary General of the CCIH. In 2008, he founded Haitian Energy Company SA. In 2012, he founded AGRITRANS SA, with the agricultural project NOURRIBIO at Trou du Nord which was Haiti's first agricultural free trade zone. The project was further extended to include over a dozen of agricultural projects. In 2014, a large-scale banana export plantation, was designed and implemented as a public-private partnership with the Government of Haiti, covering 3,000 hectares of agricultural land. His project has created 3,000 direct and 10,000 indirect jobs. For Moses, it is important that Haiti finds its place on the world map of exporting countries. He is affectionately called as "Banana Man" by the countrymen. Here are some friends and supporters of Jovenel Moise in the streets of Port-au-Prince demanding the holding of the second tour of election. 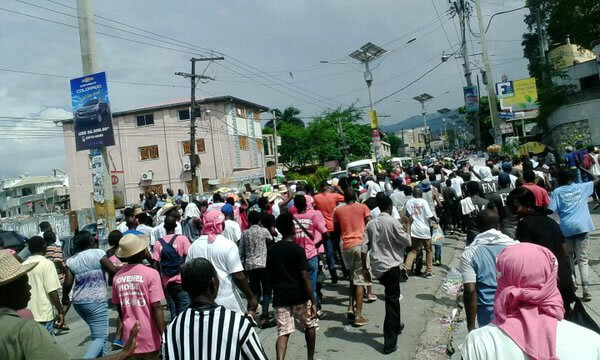 On Sunday, April 24, 2016, thousands of supporters of presidential candidate Jovenel Moise (PHTK) came to the street demanding quick second phase of elections to end a crisis of power in the country. The runoff has been postponed several times due to instable political conditions and other reasons. In the first round of presidential elections, held on October 25, 2015, Martelly nominated Jovenel Moise secured first position with 32.8% votes, defeating runner up Jude Celestin (LAPEH) with 25.3% votes. 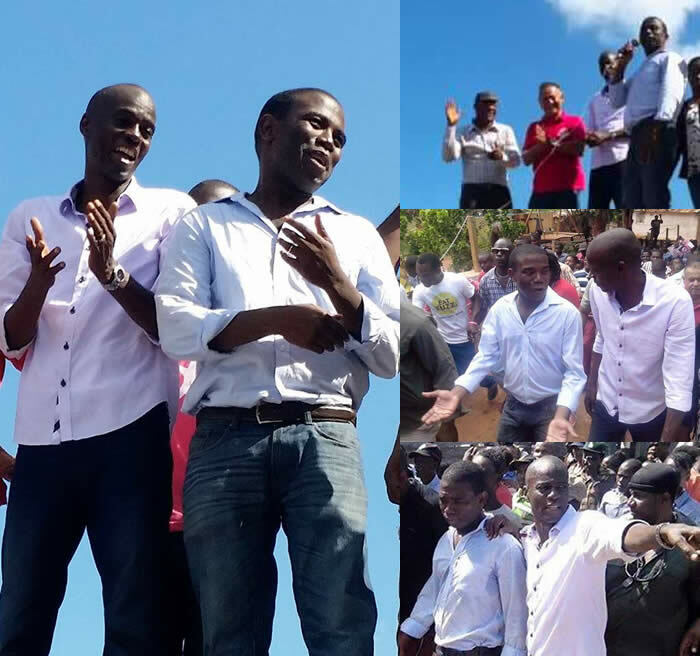 There were numerous allegations of false voting, manipulation on counting and there were huge protests against the results published by the Provisional Electoral Council (CEP) favoring Martelly's candidate Jovenel Moise. On November 29, 2015, Celestin and another seven presidential candidates, representing 49.81% of the vote, gave an ultimatum that no honest, transparent and credible election is possible by the Martelly administration in conjunction with the corrupt CEP along with the support of Police Nationale d'Haïti (PNH). Now Martelly is no more in power. Two bitter opponents, Moise (PHTK) and Celestin (LAPEH), are going to join hands and fight against Interim President Privert, demanding a quick election. There is a possibility to watch a joint rally from PHTK and LAPEH supporters on the streets demanding early elections. Here is a picture of Presidential candidate Jovenel Moise with Louis-Jodel Chamblain. 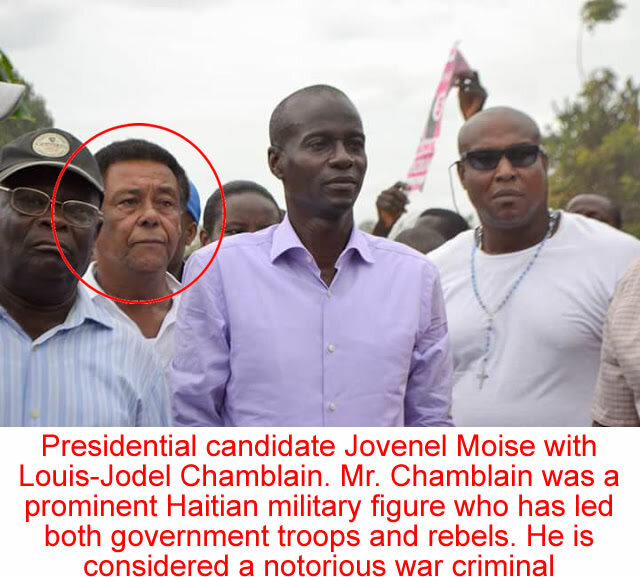 Mr. Chamblain was a prominent Haitian military figure who has led both government troops and rebels. He is considered a notorious war criminal. 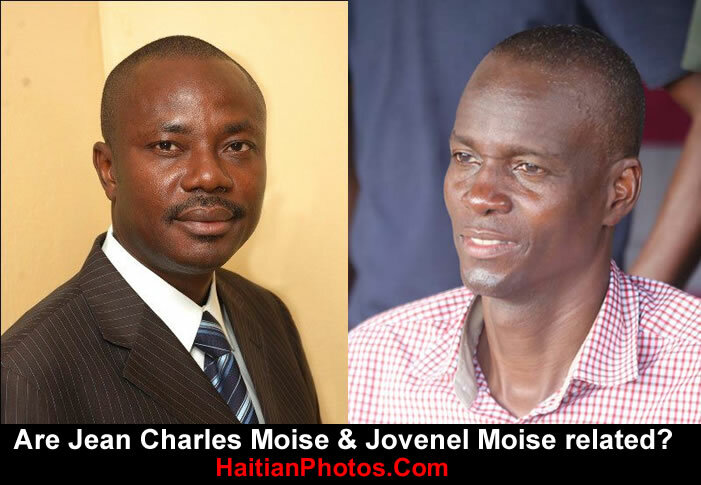 Are Jean Charles Moise & Jovenel Moise related? The question outthere is whether or not two very influential Haiian politicians are in fact related. The individuals in question are Jean Charles Moise and Jovenel Moise. They are both candidates for the presidency of Haiti in the general election in 2015 and 2016.